Make ahead breakfasts–as you can tell by the little sidebar graphic over yonder (that way —> ), I’m a big fan these days. Prior to puppy ownership, I had plenty of time to be indecisive and weigh the pros and cons of eating leftover pizza for breakfast, or to cook up a fresh bowl of hot oats and invent new topping combinations. Gone are those days. Now it goes more like this: oversleep with the hubby for 15 to 45 minutes, because we need cuddle time with each other and the puppy and are just so tired. Try to keep the dog calm in the bedroom while I frantically attempt to make the bed, brush my teeth, wash my face, control my hairs into a civilized ponytail, and put on clothes that will last me through a workout, all before Steve is out of the shower. Head downstairs and outside with Clarence; wait for him to sniff every bush in our wooded yard before settling on the perfect spot for his morning poop. Simultaneously prepare a smoothie for Steve and a bowl of veggies and raw meat for the dog, doing my best not to contaminate Steve’s healthy green smoothie with, you know, raw chicken bones. As the mothers and early morning exercisers and pet owners out there could have told me long ago, there is barely time to eat, let alone peruse the fridge and pantry for options, when you’re on this kind of morning schedule. What I need is something, preferably healthy, hearty, and savory, that I can pop in the microwave while unloading the clean dishwasher, then eat in five to ten minutes while the puppy digests his breakfast. Enter accidentally vegan breakfast tacos with pinto bean and veggie filling. When I put breakfast tacos on the blog calendar after obsessing over them in Austin, I was planning to provide the basic scrambled egg and veggies formula. That classic version is light and fluffy, absolutely yummy sprinkled with some grated cheddar and salsa. But, on the weekend morning when I was all set to run through the recipe, I couldn’t ignore the gigantic tub of pinto beans I’d cooked up, nor the three avocados in the fruit drawer nearing their demise. Totally contrary to my nature, I went with the flow and cooked up a kind of healthy refried beans breakfast taco, and here we are! The scrambled egg breakfast taco will have to wait for a later date. 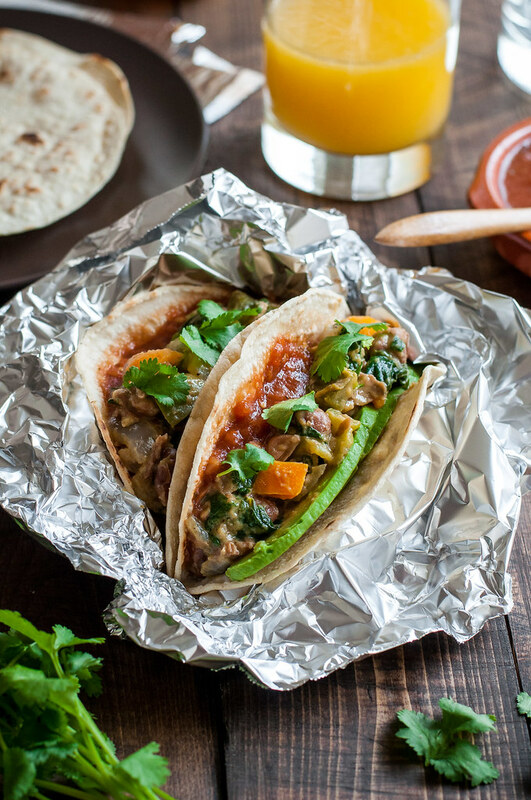 Unlike eggs, this pinto bean and vegetable taco filling holds up like a champ in the fridge for days, so now we can eat breakfast tacos on an otherwise mundane weekday morning?! Yes, yes, and yes. Tofu is a popular option for vegan breakfast tacos, and it certainly comes close to the scrambled egg vibe while lasting when made ahead, but I have a few qualms with using it in breakfast tacos. One, the flavor of nutritional yeast that usually accompanies a tofu scramble is just not my thing, and two, tofu scramble tends to be crumbly and fall out of your taco quicker than you can eat it. Third, my husband usually joins me on breakfast taco days, and there’s no way he’s touching tofu anything. Finally, whereas you can quickly drain some canned beans for use in this recipe, tofu requires at least 30 minutes of pressing if you’re serious about the quality of your scramble. That’s not to say you won’t ever see tofu breakfast tacos on NCK, but it makes much more sense to me to use beans in a make ahead vegan breakfast taco. Until screwing up the first bean breakfast taco photo shoot, I wasn’t really sure how to best store these things for the week. Soft tacos are tricky like that: either the tortilla ends up totally mushy, soaked by the liquid in the filling, or you put them into a normal rectangular Gladware and they turn into taco salad. Not so with foil. Sure, I primped the packets a little bit for the pictures, but I also wrapped up my leftovers for the week after the photo shoot, in foil, just as I recommend. This morning I popped a packet in the oven, and after 15 minutes at about 250, they were warm and not at all mushy. Most of the moisture is cooked off the beans when you make the filling, so the tortilla doesn’t become a wet sponge. The foil serves as a plate, saving a dirty dish. If you’re pressed for time and prefer to eat after arriving at your morning destination, though, just set your tacos in a bowl and zap them in the microwave briefly. Same result, different method. 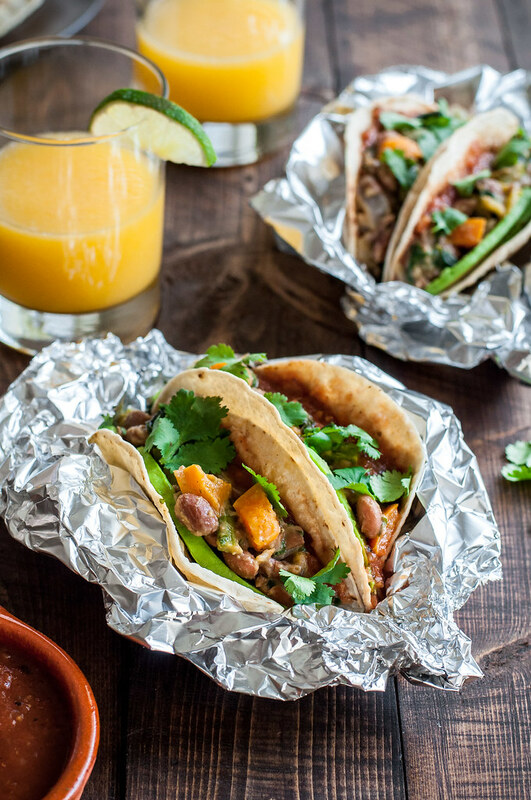 What I love about these specific bean breakfast tacos, besides the make ahead factor, is that they’re totally plant based (i.e., vegan) and gluten free, without really trying. I am neither vegan nor 100% gluten free these days, but, especially at breakfast and lunch, when I need good, clean fuel to keep me going strong for a busy day, I try really hard to stay away from lots of dairy, eggs, and bread. That’s tough if you love savory breakfast! Nothing beats a cheesy breakfast sandwich or tender piece of buttered toast, but corn tortillas definitely give you that bread-y chew that comes close. 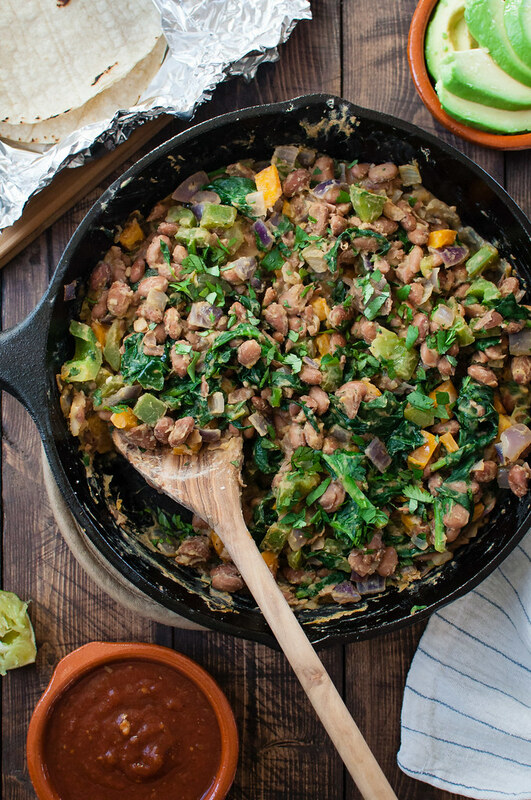 The amount of veggies “hiding” in the beans is pretty amazing, even if you are a veggie lover, and the beans themselves, packed with protein and fiber, will keep a tummy full for hours. Gluten free and vegan. Since make ahead beans hold up much better than scrambled eggs, make a batch of these tacos for the whole week. Assemble in sets of two, seal in foil, and heat in the oven while you get ready. Or, reheat on a plate in the microwave once you get to work or school. Heat the tortillas. Char them over a low gas flame until darkened in just a few places on both sides, or, heat a medium cast iron or nonstick skillet over medium high heat. Warm tortillas for about a minute on each side in the dry pan, then transfer to large piece of foil and fold over to keep warm. Transfer the packet of tortillas to the microwave (don't turn it on!) or a low oven while you prepare the filling. Chop the bell pepper and onion. Slice the avocado and toss with juice from a quarter of a lime plus a pinch of salt. When you're done heating the tortillas, heat oil over medium high in the skillet until quite hot. Add the peppers and onions and stir infrequently, until browned and moderately tender. Add beans, stock, and ½ teaspoon salt. Bring to a boil, then simmer about 5 minutes, mashing some of the beans against the bottom of the pan with a spoon or spatula. When just a bit of liquid remains, reduce heat to medium low, add the spinach, and stir. Cook a couple minutes, until spinach is wilted, then add juice from a quarter of the lime, the cilantro, and salt and pepper to taste. 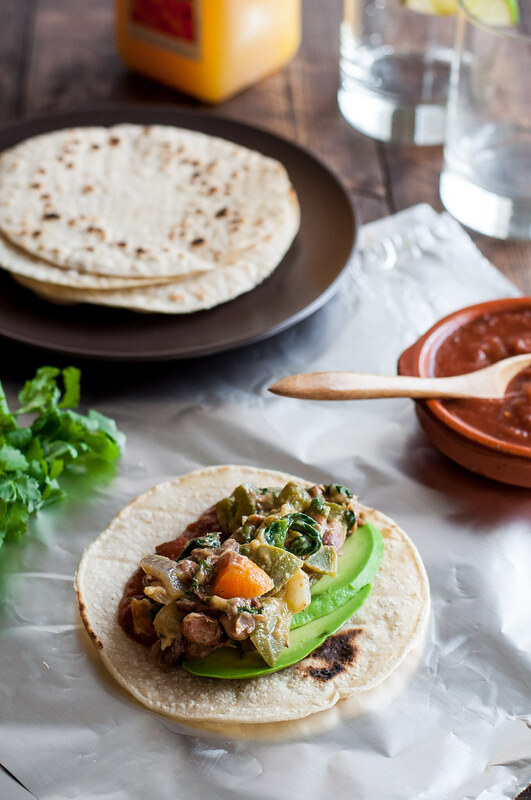 To serve, top each tortilla with a scoop of beans, a few slices of avocado, and some salsa. Sprinkle with cilantro, then fold in half or roll. 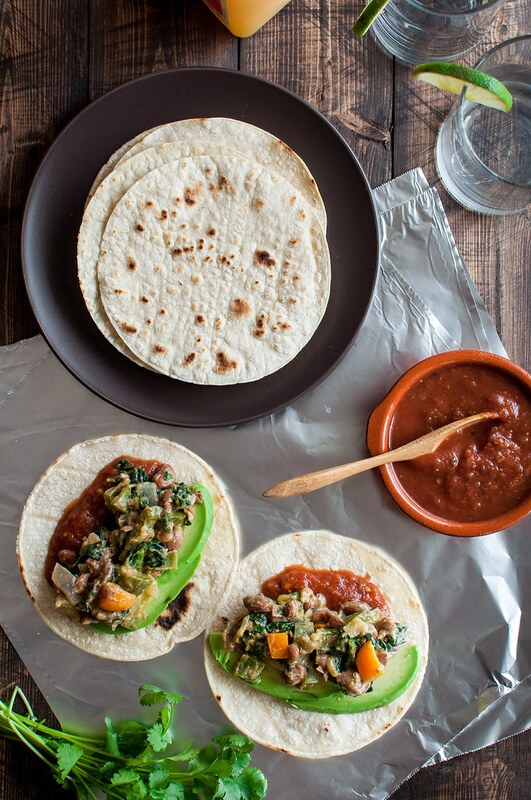 The formula for these tacos is simple, but if you have time and ingredients, feel free to spice up the bean mixture with chili powder, cumin, garlic, or other favorite flavors. Add them to the veggies a minute or two before adding the liquid. I love pinto beans in this recipe, but you can also use another type. Black beans would be great. 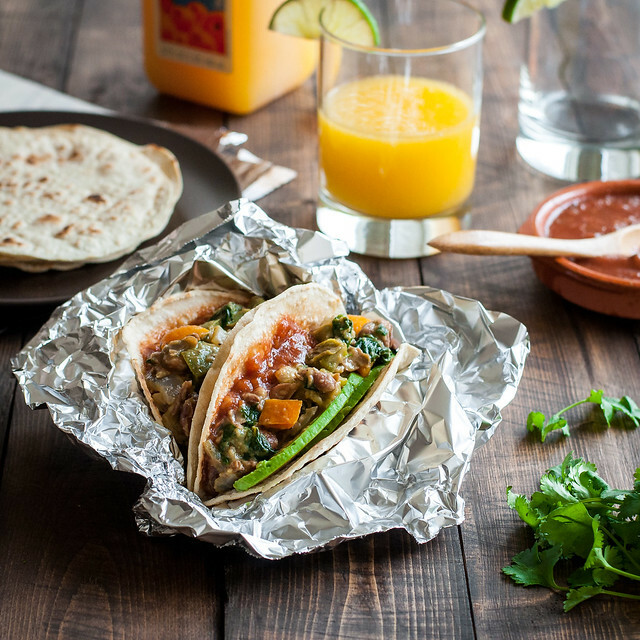 My breakfast taco adventures were first inspired by this recipe by Adriene. 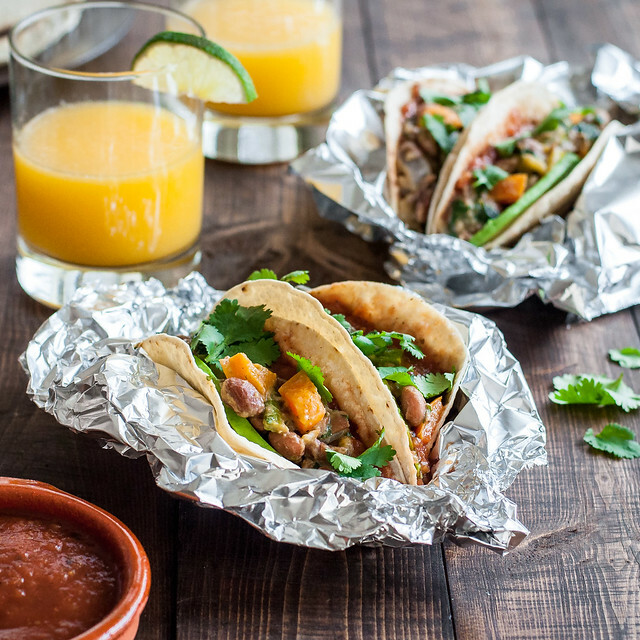 We almost always have cooked dried beans on hand in one form or another and love them in a breakfast wrap, so I know we’ll enjoy your veggie-bean tacos as much as any combo we do here. Breakfast isn’t just cereal, eggs and bacon any more, that’s for sure! Completely agree! I’m trying to post lots of my “real life” breakfasts on the blog this year. This morning I made oats with tamari, avocado, and sesame seeds. Hit the spot! I recently developed an egg allergy which eliminates so many savory breakfast recipes. My doctor also wants me to go on a low salt, low cholesterol diet and these sound perfect for a breakfast that doesn’t make me feel deprived of the good things. 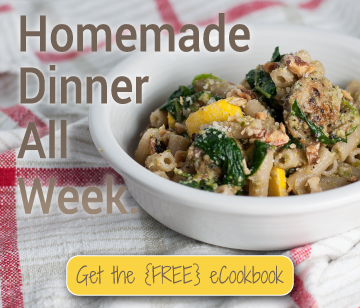 Thank you for posting these recipes.